This Sautéed Sweet Asparagus is my favorite way to prepare asparagus. It is a low-calorie side dish that is sautéed, slightly sweet, and healthy! This is by far my favorite way to prepare asparagus. It is so easy and everyone will be asking for more! I have mentioned several times throughout this site that any recipe coming from my Aunt Lana is a winner. This is one of them! I LOVE the sweetness to this asparagus and it always turns out perfect. You don’t get your soggy green, overdone asparagus doing it this way. Your family will love it! With only 3 ingredients you can’t lose! Serve with Easter dinner or any other springtime meal! Rinse and snap off the bottoms of each asparagus stalk (discard the bottoms). 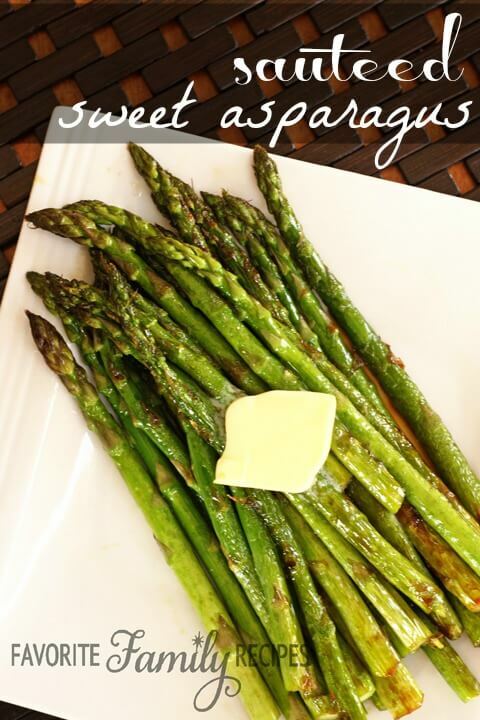 Melt butter in a large skillet and add asparagus. Sprinkle sugar over top of the asparagus. Sauté over medium-high heat for 5-7 minutes or to your preferred doneness. Erica! I can’t believe this! I was searching for a great asparagus recipe on Pinterest, read: I have no clue how to make asparagus and I am am in charge of it for Easter dinner, and I found your picture. When I clicked on it to get more information I found out it is from YOU! I can’t believe this! Such a small world!! You look great! I hope you are doing amazing! I will be sure to keep following you here 🙂 Thanks for the asparagus help! I am making it tonight. I was honestly skeptical about this recipe because I prefer roasted, savory asparagus… But my kids HATE it that way. I have made this twice now and they both (1 and 4 years old) eat it up! My husband was also skeptical while it was cooking, but he loves it too! I omit the sugar, start to saute mushrooms in olive oil and butter, when the mushrooms are steaming I add sliced onions, last I add the asparagus. Italian seasoning to taste.